The first coins used in Scotland were probably those brought in by the Romans. The first Scottish coins were issued in the reign of David I round about 12th century. They were silver pennies called "sterlings" similar to coins issued in England. Silver groats (four pence) and half-groats appeared in the 14th century when the first gold coin was struck. This was a "noble" and the first such coins had a lion rampant on them! The first Scottish coin to bear a date was a gold ducat issued by James V in 1539. This shows the King in a flat cap and was referred to as a "bonnet" as a result! Around the same time a coin to the value of 6 pence was issued called a "bawbee" (worth 6 old Scottish pennies, equivalent to a halfpenny Sterling. The name was probably derived from "Sillebawbe", a part of the country where Archibald Orrock (a 16th century master of the mint) had his residence. There is evidence that the great Italian banking houses were active in Scotland in the Middle Ages and they may have introduced the concept of the bill of exchange. Italians were involved in the transfer of papal taxes from Scotland and the origin of the word ´Bank´ is the ´Banco´ or bench used by the Italian merchants and money lenders. By the seventeenth century two groups in Edinburgh, the merchants and the goldsmiths, were providing a simple form of banking. Some of the more prosperous merchants were willing to extend short-term credit to others to cover the period between buying and re-selling goods. Merchants also acted as money changers and dealers in foreign exchange. This was an important function since Scotland being a small economy, foreign coins circulated alongside the Scottish coins. Goldsmiths were also involved in money changing and foreign exchange as well as bullion dealing. Scottish merchant and goldsmith bankers suffered the same problems as their English counterparts namely - limited resources and small scale of operation. As in England there were those who argued for the establishment of a joint-stock bank (what we know today as a limited liability company) and the founding of the Bank of England in 1694 provided a useful precedent. The Bank of Scotland was established in 1695, one year after the Bank of England by an Act of the Scottish Parliament. It was a great age for the promotion of new business ventures and while many other ventures of the period were not so successful both banks have just celebrated their tercentenaries. From the beginning the Bank of Scotland was a very different institution from the Bank of England. Whereas the Bank of England was closely aligned with government and made a massive loan to the King, the Bank of Scotland was concerned with the needs of commerce and was actually forbidden to lend to the government without parliamentary approval. It is one of the peculiarities of history that while it was a Scotsman, William Paterson, who prompted the establishment of the Bank of England, it was an Englishman, John Holland, a London merchant, who was most closely association with the foundation of the Bank of Scotland. 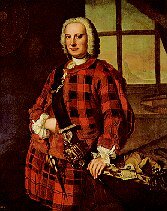 Holland went on to serve as the Scottish bank´s first Governor although most of the support for the new company came from citizens of Edinburgh or from Scots settled in London. The Bank of Scotland began by issuing notes and making loans and notes were issued for £100, £50, £10 and £5. A twenty shillings (one pound) note was introduced in 1704. Remember the value of money in those days and you will realise that banks were only for the really wealthy. The new notes proved a convenient and attractive means of payment. The notes were easier to handle than coins and more reliable since their value was clearly stated and guaranteed by the Bank. Scotland became one of the first countries in the world to use paper currency from choice. The Bank put its notes into circulation as loans to borrowers and they were acceptable as long as there was general confidence in the Bank´s ability to redeem its notes for gold or silver. The Bank in effect received an interest-free loan from those holding its notes while earning interest from those to whom the notes were issued as loans. So important was the notes issue as a way of financing its lending in its early years that the Bank of Scotland did not accept deposits on a regular basis until 1708. The first notes were bound in books rather like a modern cheque book, but without perforations. The bank cashier would cut them out with a knife or scissors. Impatient issuers might perhaps just tear them out – the ragged edges were used when the notes were returned as an early form of detecting forgeries. Clearly volumes were not large! The Bank of Scotland was established by Act of the Scottish Parliament which included the unusual privilege that foreign investors in the Bank "shall be and become naturalised Scotsmen to all intents and purposes whatsoever". The Act granted the Bank of Scotland a monopoly of public banking for twenty-one years during which time its dividends were to be exempted from tax. This monopoly was subsequently allowed to lapse - a significant development since it allowed the future establishment of other joint-stock banks. In consequence banking in Scotland developed differently from banking in England where one bank, the Bank of England was in a dominant position over the other, smaller banks. Even before the loss of its monopoly the Bank of Scotland was faced by a rival. The competition to the Bank of Scotland came from a rather unusual source, the Darien Company which was formed as a Scottish overseas trading venture. Rather than let its funds lie idle while it pushed ahead with its own schemes the Darien Company lent them out at interest to its members and began to issue its own notes. The Darien Company´s attempts to establish a colony on the Isthmus of Panama failed and the subsequent collapse of the company was a tremendous loss to Scottish investors. Part of the arrangements under the Act of Union (1707) provided finance to compensate the subscribers. The financial arrangements were complicated and to protect their interests the investors set up a society, the Equivalent Society which became the Equivalent company in 1724. The new company sought to move into banking and this request was received sympathetically by the government. The "Old Bank", the Bank of Scotland, was suspected of Jacobite sympathies and, with 1715 still a recent memory, a Royal Charter was granted in 1727 to the "New Bank" with the title of Royal Bank of Scotland. Thus Scotland gained two-joint-stock banks to England´s one; legal corporations with the right to sue and be sued and, for their shareholders, limited liability. Fierce competition ensued between the "Old Bank" and the "new", much of which centred on the note-issue. The aim of the Royal Bank of Scotland was either to force the Bank of Scotland out of business or to take it over on terms favourable to the Royal Bank´s shareholders. The Royal Bank´s strategy was to build up large holdings of its rival´s notes, acquired in exchange for its own, and then suddenly present them to the Bank of Scotland for payment. To meet these demands the Old Bank was forced to call in its loans and in March 1728 to suspend payments. This relieved the immediate pressure on the Bank of Scotland but hurt its reputation and allowed the Royal Bank a clear field to extend its own lending and note issue. This increased note issue made the Royal Bank open to the same kind of attacks but despite talks of a merger the Royal Bank lacked the strength to carry its scheme through to fruition. 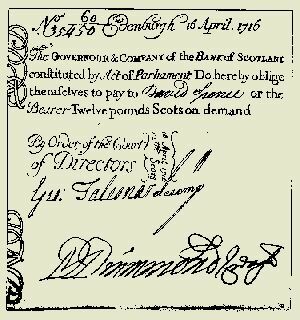 By September 1728 the Bank of Scotland was able to start redeeming its notes with interest and in March 1729 to resume lending. As a defence against similar attacks in the future, the Bank of Scotland added an "optional clause" to its notes which gave it the option of making the notes interest-bearing while delaying payment for six months. Despite its failure the Royal Bank maintained a considerable holding of Bank of Scotland notes as a potential threat. But they too incorporated the "optional clauses"
Eventually both banks realised that this type of competition was mutually destructive and a truce was arranged. Even so it was not until 1751 that the Bank of Scotland and the Royal Bank of Scotland agreed to accept each other´s notes. Elsewhere in Scotland some banking services such as discounting and exchange, were provided by merchants. As the pace of economic change gathered speed, the demand for banking services grew and it was not long before other organisations developed to fill the apparent void. The problem was that the two Edinburgh banks concentrated the provision of most of their credit in Edinburgh. Before a Glasgow merchant could borrow from one of them, he would have to be well known in the capital. Only the more senior Glasgow tobacco lords found themselves creditworthy. A more satisfactory solution arose when merchants in the other cities and major towns began to set up their own banks. Whereas English merchants were not given the same freedom to set up as bankers, there was no legal restriction in Scotland to prevent the Scottish merchants from doing this. In the background to this was the emergence of the British Linen Company as a potent force on the banking scene. Formed in 1746 to promote the Scottish linen industry, this company soon developed banking services which it offered to customers at its offices in many parts of Scotland. The British Linen was therefore the real pioneer of branch banking although Bank of Scotland had tried, unsuccessfully, to establish a branch network in the 1690s and again in the 1730s. it was more successful at its third attempt in the 1770s. The Royal Bank, by contrast, maintained just one branch for many years. This was in Glasgow but it soon became one of the busiest bank offices anywhere in the United Kingdom. Subsequently many more banks were established to meet the needs of an expanding economy. In this, Scotland benefited from its separate legal system and the fact that the prohibition on banks of more and six partners did not apply north of the border. These early banks were not joint-stock companies but they were able to have many more partners than the English private banks. In some cases there were over 2,000 partners. Another major aspect of banking which developed in the eighteenth century was lending by cash credit. Although the bulk of lending was by discounting trade bills, the cash credit (forerunner of the modern overdraft) was a popular lending device. It was developed by the Royal Bank early in the 18th century but, eventually, all banks offered advances to their customers by this means. The next major element of this emerging banking system was the acceptance of deposits and the paying of interest. This was by no means a new idea but the Scots were the first to develop it as a significant and continuing activity on a large scale. Significantly it first developed in Glasgow where the pace of economic progress was most rapid and the demand for funds was greatest. In 1772 there occurred one of the worst commercial crises that Scotland has ever seen. Several of the small private banks in Edinburgh failed as did one of the largest of the provincial banking companies. The crisis might have been even more serious had it not been for another innovation - the Bank of Scotland, the Royal Bank and, to some extent, the British Linen company acted as lenders of last resort by lending cash to some of the provincial banking companies, whose business was otherwise sound, but who had problems of providing adequate liquid assets to meet the demands of their customers. In other words the Edinburgh bankers were prepared to develop at least some of the functions nowadays normally associated with a Central Bank. The willingness of the Edinburgh bankers to act in this way brought considerable stability and confidence to the Scottish banking system. Thereafter commercial crises were never experienced with such intensity as they were in other parts of the British isles. The preparedness of the banks to help one another meant that the banks were also better able to help their customers through difficult times. In the 18th century after the Union of parliaments and "Monetary Union" at that time, exchange rates were fixed at £12 Scots to £1 sterling and notes were sometimes issued expressed in both currencies. Early notes were printed in black only. It was not until September 1777 that the Royal Bank of Scotland pioneered the use of colour in banknotes with a blue rectangle displaying the words ´one Guinea´ and the Kings head shown in red. Colour did not come into widescale use for nearly a century later. Banknotes were originally printed on one side only. The attempts to prevent forgery from a skilled engraver were certainly not on the scale of today´s complex designs. The main deterrents were a water-marked paper, a mezzo-tint portrait of George II, an embossed bank seal and the signature of the Cashier. The accepted Scots punishment at that time of death or amputation of hand and/or tongue may have proved more effective! As printing capabilities developed in the 19th century, designs became more and more complex to deter forgery - the banks always trying to keep one step ahead. Stamp Duty was first levied on bank notes in 1783. At first the Stamp Duty related only to those over one guinea but by 1800 it had to be paid on every banknote. Under the Act the paper had to be stamped before each note was printed. Stamping the paper was a lengthy process as it involved the Scottish banks travelling to the Stamp Office in London by stagecoach. In 1808 the Scottish banks were granted the concession of issuing their notes on unstamped paper and paying the duty in a lump sum. But the development of banks and bank notes was not always smooth as we saw earlier and in 1826 another threat to the issue of the Scottish £1 notes arose. Following the failure of 60 banks in England with considerable losses to the public an Act was passed forbidding the circulation of notes under £5 in England. The threat to the £1 notes - the only paper currency familiar to the great masses of the Scottish people - aroused widespread criticism especially as only two banks in Scotland had failed. Sir Walter Scott writing as Sir Malachi Malagruther came to the defence of Scottish banking. Members of Parliament, the Press and a host of pamphleteers clamoured against confirming to the English style. Of course, Sir Walter Scott´s bankruptcy at the time may have encouraged him to help the banks! "a system admirably calculated to economise the use of Capital to excite and cherish a spirit of useful Enterprise, and even to promote the moral habits of the people, by the direct inducements which it holds out to the maintenance of a character for industry, integrity and prudence." BCCI and Barings Bank eat your heart out!! The result was that the Scottish banks were allowed to keep their note issues. But this enquiry also meant that legislators in London became increasingly aware of the Scottish system of banking and its successes compared with the English system and its weaknesses. Somewhat in the background, another trend was developing which was to have a significant impact on Scottish life. The first Savings Bank was founded in Ruthwell in Dumfries-shire in 1810 by the Rev. Henry Duncan. He had seen his parrishioners spending their earnings from smuggling to the Isle of Man during the Napoleonic and wars and then becoming impoverished again when the wars ended. At that time banks were not catering for working people (the minimum deposit at the time was five pounds - more than most people earned in a year. From Rithwell the movement spread throughout the country and to many other parts of the world. These were not commercial banks, for they did not lend money to businesses or issue bank notes. Their deposits, for the most part, were invested with the Commissioners for the National Debt. Nevertheless, their contribution to the cult of Scottish thrift was quite simply enormous. Moreover their off-shoots, the penny savings banks, carried the tradition to all levels of Scottish society. In 1844, after another period of severe financial crisis, Sir Robert Peel took advantage of a review of the Bank of England´s Charter to regulate the issue of notes. The Banknote (Scotland) Act was passed in 1845 and this Act (with some later amendments) regulates today´s note issue by the Scottish banks. The banks were permitted to issue notes to the extent of the average circulation for the year to 1 May 1845 without any backing or cover of coin or security. Today that privilege seems very small indeed. For the three Scottish banks which today issue their own banknotes only £3m comes under that privilege out of nearly £1,800m in circulation. All the rest has to be covered at the Bank of England by non-interest bearing deposits or by the banks´ own holdings of Bank of England notes or coin. But restrictions on note issues were placed on the English banks so that by the early part of the 20th century only the bank of England was left issuing notes south of the border. London was fast developing as an international financial centre and in the 1860s the Scottish banks began to open offices there. This provoked a storm of protest from the English banks but their protests were overcome. In 1874 the Clydesdale Bank opened three offices in the north of England. This provoked howls of outrage from English bankers and the government appointed a committee of enquiry. Evidence was taken but no report was produced. Nevertheless, the Clydesdale, and the other Scottish banks which were about to follow its example, abandoned their plans to open English branch networks and there the matter stood for a century. The Scots confined themselves to Scotland, apart from their London offices, and the English banks agreed not to open north of the border. This was an important decision because, at that time, banking was under-developed in England and it seems that the Scots would have had the strength to stage takeover bids for many of the English banks. Over the next 30 years the English banks, by processes of merger, acquisition and takeover, and also by extensive branch opening policies, consolidated their position and there emerged the ´Big Five". By 1913, the Midland Bank was the largest bank in the world. Towards the end of the First World War some of the English banks turned their attention to Scotland and Ireland and began a process of acquisition of domestic banks. Four of Scotland´s eight banks were taken over in this way although these take-overs were referred to as ´affiliations" and the Scottish banks retained their own identities, note issues and boards of directors. There does not appear to have been much direct interference in the activities of these affiliated banks by their English parents. The structural changes were introduced in 1975 and the new business activities came gradually over the next few years. It was then announced that the bank would be sold to the public. This was a controversial move as, until then, it had been assumed, by many people, that the banks were mutual organisations which were owned by their depositors. Nevertheless, the privatisation went ahead in 1986 and was accompanied by further restructuring which resulted in there being just one bank - TSB Bank Scotland PLC. The share capital of this organisation was acquired by Lloyds Bank in 1995. The more competitive banking environment resulted in a more diversified structure. In the 1970s English banks began to open branches north of the border and the Scots opened branches in England. The English incursion amounted to very little and was never any attempt to establish extensive branch networks. The Scots excursion into England was of a more substantial nature and the Royal Bank decided to dispense with the name of its England subsidiary and merge it fully into the Royal Bank. This made it a truly UK organisation. Merchant banks - such as Noble, Grossart and Co - began to be formed. These banks, traditionally found only in London, provided specialised services for corporate clients. Bank of Scotland, which had acquired the old British Linen Bank in 1971, re-launched its merchant bank subsidiary using the old name. Overseas banks also began come to Scotland, mainly to Edinburgh, attracted largely by the opportunities for doing business in an oil producing country. There are now over 50 banks, recognised by the Bank of England, operating in Scotland. The tremendous growth of competition in the 1970s and 1980s happily coincided with great strides forward in the availability of electronic technology. The Scottish banks were eager developers and purchasers of the new technology and soon acquired a reputation as innovators. Just as they had developed new forms of business in the 18th century, the Scottish banks in the late 20th century are, if anything, even more innovative. An interesting feature of the Scottish banknotes issue has been the fact that they have never, apart from under temporary provisions introduced in both World Wars, been "legal tender" even in Scotland, although they are, of course, accepted as legal currency. Today, in fact, no banknotes whatsoever (including Bank of England notes!) qualifies for the term "legal tender" north of the Border and the Scottish economy seems to manage without that legal protection. It should be noted that all Scottish bank notes, even designs which are no longer issued or by banks which no longer operate can still be redeemed by the banks which issued them (or which subsequently took them over). Of course, if you have old notes they may well be worth more than face value to a note collector! With a population which has grown to a (current) level of only around 5 million, Scotland has earned an enviable reputation as a centre of excellence for financial services. Edinburgh is the fourth largest fincial centre in Europe (after London, Frankfurt and Paris). Much of this reputation has arisen from its history of innovation over the last three hundred years. Her are just some of the "firsts"
1695 - Bank of Scotland Britain´s first joint stock clearing bank, established by Act of Scots Parliament. 1728 - On 31 May, 1728, the Royal Bank of Scotland invents the overdraft, one of the most versatile and imaginative innovations in modern banking. It allows a William Hogg, merchant in the High Street Edinburgh, to take out of his account up to £1000 (£65,449 in today´s value) more than he has in it. 1750 - British Linen Bank (a Scottish bank, despite its name) began building up branch networks, unknown elsewhere in the world and the basis for the unusual stability of the Scottish banking system which led Karl Marx to observe that capitalism created banking crises, except in Scotland. 1777 - A Scottish bank becomes the first in Europe to print multi-coloured banknotes - the head of the king is printed in red and a special graphic for the denomination in blue. 1810 - World´s first mutual savings bank formed in Dumfriesshire from which the world wide mutual savings bank movement emerged. 1826 - Royal Bank pioneers double-sided printing of banknotes. 1875 - Chartered Institute of Bankers in Scotland formed - the first professional organisation for bankers in the world. 1946 - In answer to the request of one of its customers, National Bank of Scotland launches the world´s first mobile bank. It uses a Studebaker van left behind by the US forces pay corps. 1954 - Royal Bank is the first British Bank to move into hire purchase. 1958 - Bank of Scotland is the first UK bank to set up centralised accounting unit and in 1961 was amongst the first to install a computer. 1967 - Scotland´s first cash dispenser was installed at the Royal Bank´s Edinburgh West End Office. 1972 - Royal Bank of Scotland is the first UK bank to offer house purchase loan schemes for customers. 1972 - Williams & Glyn´s, the wholly owned subsidiary of the Royal Bank operating in England and Wales, becomes the first British bank to offer free banking to customers who keep their account in credit. 1980 - In the early 1980´s the Bank of Scotland developed a particular expertise for funding senior debt for Management Buy-Outs and in the period from 1990 is the leading provider of senior debt finance in the UK. 1980 - Royal Bank Cashline becomes the busiest ATM system in the world in terms of how frequently each machine is used and how much money is taken out each time. 1985 - Royal Bank becomes the first British bank to underwrite insurance as it sets up Direct Line Insurance. Within 10 years it is Britain´s largest ever car insurance and diversifies into household insurance and other financial services. 1989 - Royal Bank acquires Citizens Financial of Rhode Island, USA in what turns out to be the most effective move by a British bank into North America. Citizens leaps from assets US$2.5 billion to US$15 billion in six years - and still rising. 1990 - IBOS (Inter-bank On-line System) is developed by Royal Bank of Scotland and Banco Santander to provide a cross-border European banking service that is speedy, economical and transparent. 1991 - Royal Bank pilots Britain´s first photo-card with photographs of customers laser etched with their signatures into the plastic of the card. Within eighteen months, photographs prove effective cutting fraud to 1 percent of normal rate and are extended throughout network and later to credit cards. 1991 - Royal Bank of Scotland issues a special £1 note to commemorate the European Summit held at the Palace of Holyroodhouse. This is the first commemorative note to be issued in Britain or indeed the European Union. 1994 - Cashline launched Britain´s first mobile cash-dispenser, which made its appearance at the Open golf Championship at Turnberry. 1995 - Royal Bank underwrites Scotland´s largest corporate takeover bid - the successful acquisition of Manweb by Scottish Power. 1997 - Royal Bank is the first bank or Building Society to offer all cash machine card holders access to their Cashline network - 22,000 ATM´s in UK now available to Royal Bank customers. Throughout the 19th and 20th centuries the Scots exported their banking system and their bankers to all corners of the world. The Scottish banker became a component of the Scottish diaspora every bit as important as the doctor, the engineer and the missionary. As in so many aspects of life, the attention which the Scots paid to the importance of education was manifest in the formation of the Institute of Bankers in Scotland in 1875 - the world´s oldest professional body for practising bankers. The professionalism of Scottish bankers was therefore a major factor in the superior performance of the Scottish banks in the recession of the 1990s. Parts of this page are based on an essay by Dr Charles W Munn, Chief Executive, The Chartered Institute of Bankers in Scotland.